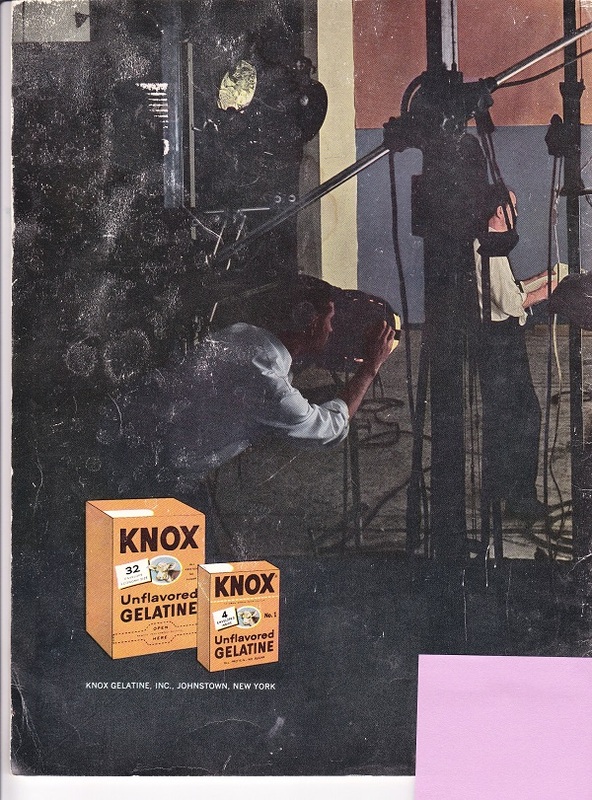 For those of you wondering what Knox is, it is the unflavored gelatin. When I was a young teen it was touted as something to make your fingernails healthy and long if you drank it before it cooled. My nails never looked good though. Next Post:Are your kids using drugs? 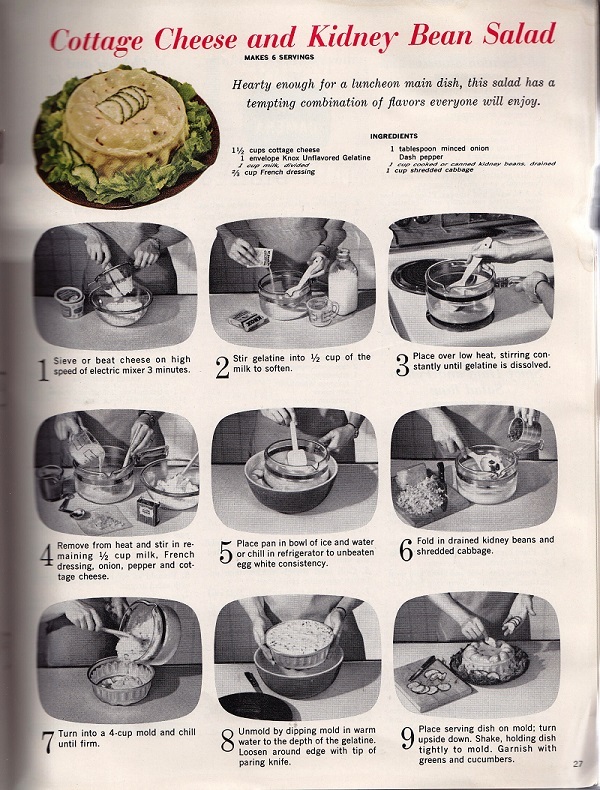 This reminded me of my mother’s recipe box–she had a ton of gelatin recipes. The worst sounding was with sauerkraut. Luckily, I don’t remember her ever making it. Yum! Thanks for the Tomato Aspic recipe. One of my favorites. Great with tuna too. Def will have to try the Tomato Cheese Balls. Thanks again for posting! 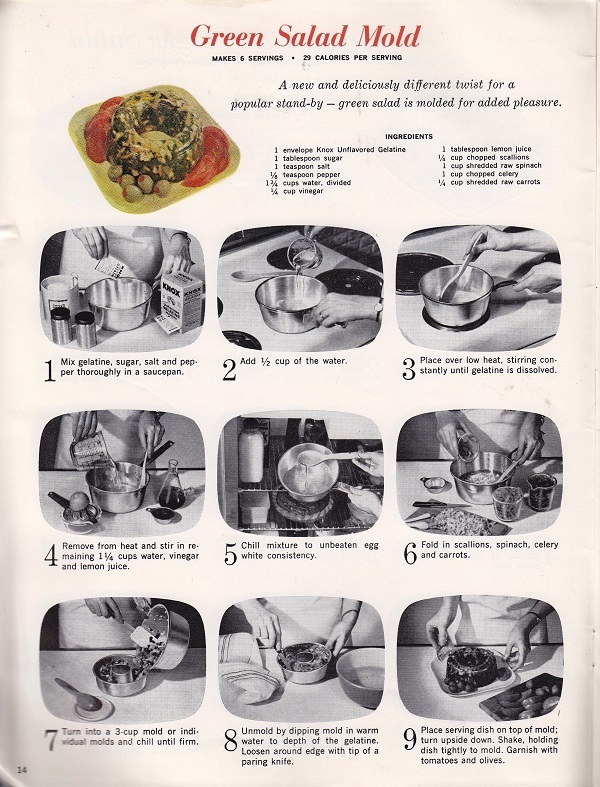 Because they sound so awful, I’m tempted to actually try making the Green salad mold or some other gelatin recipe. At some point they were popular…for a reason, no? 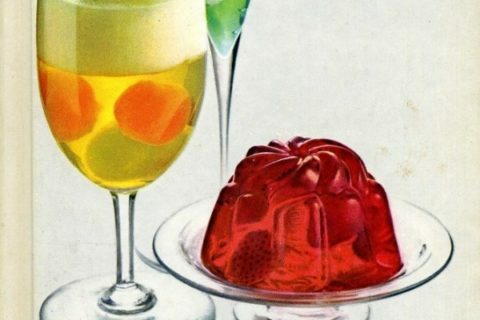 Anyone here try the gelatin recipes and find them delicious? I really wish I could unsee that tomato aspic. Block of tomato Jell-o with cucumbers on top? No thank you! This post should come with a warning not to read while eating. Kidney bean and cottage cheese? – I want to see if anyone can keep that one down in a food challenge. No kidding. I almost gagged just reading the title of that recipe. I happen to like cottage cheese – and kidney beans – but in one bowl? Stirred together? Blech. 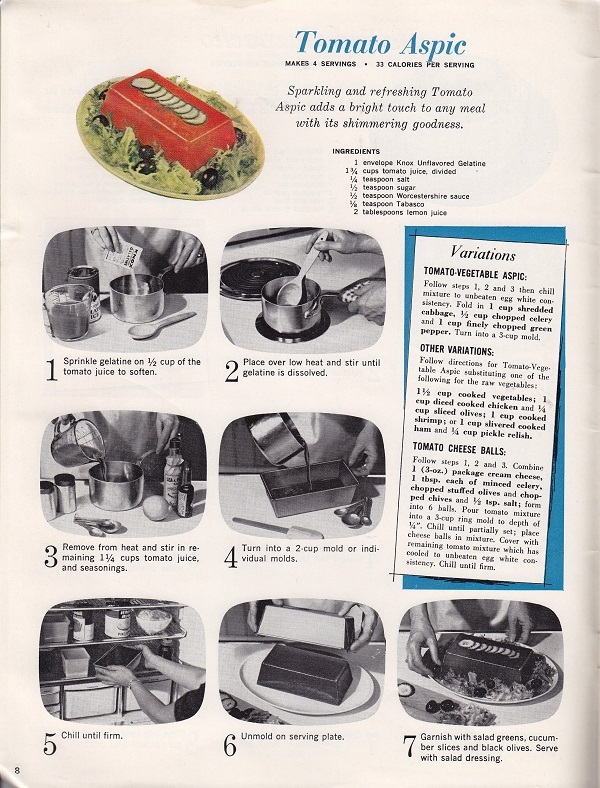 Fortunately for me, my mother never made gelatin molds! The most she did was make lime Jello in the sliced pineapple can (with half pineapple juice). It made the prettiest rings she would set on cottage cheese and a lettuce leaf! My kids got so tired of Grandma’s pineapple and cottage cheese lunches, it was all she fixed them! 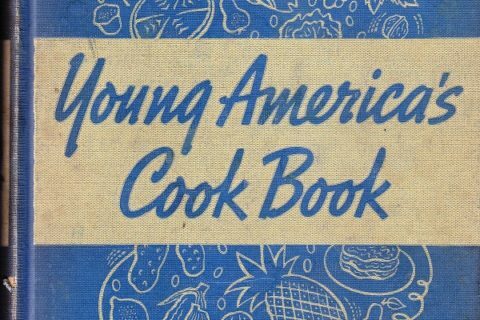 James Lileks showed more pieces of this recipe book on his aptly-named Gallery of Regrettable Food site. I thought I recognized this book from somewhere. I love that snarky site. aspic. What an unfortunate name for a food item. 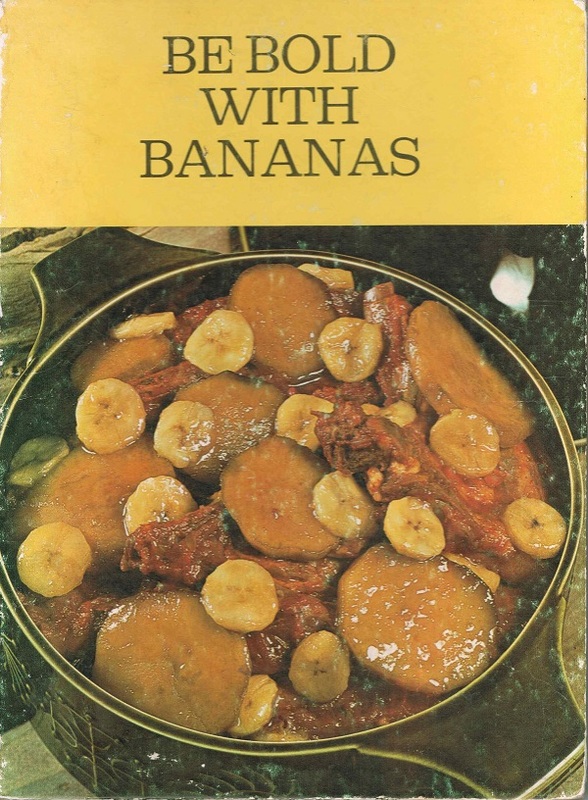 WHY did people continue to think these recipes were OK, WHY? Green Salad Mold sounds like something on a salad that’s well past its prime. 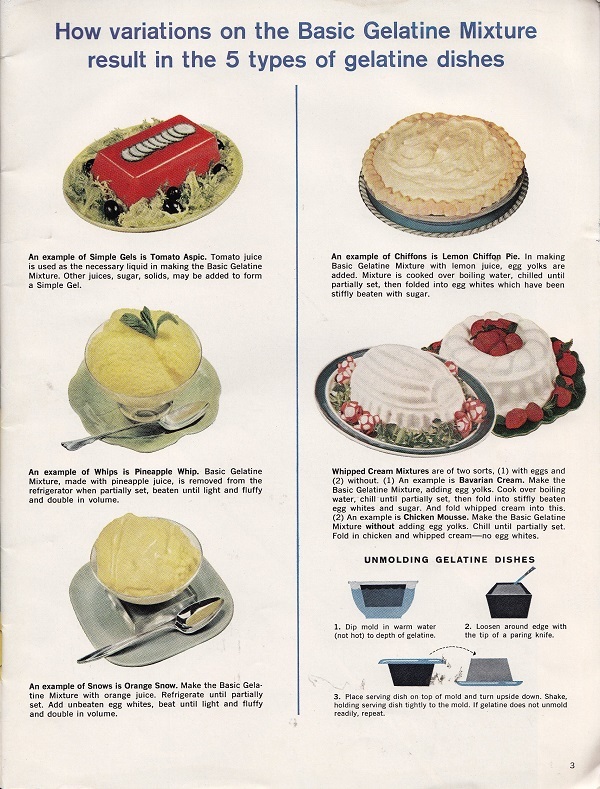 I will never understand the mid-20th-Century passion for encasing everything in gelatin. 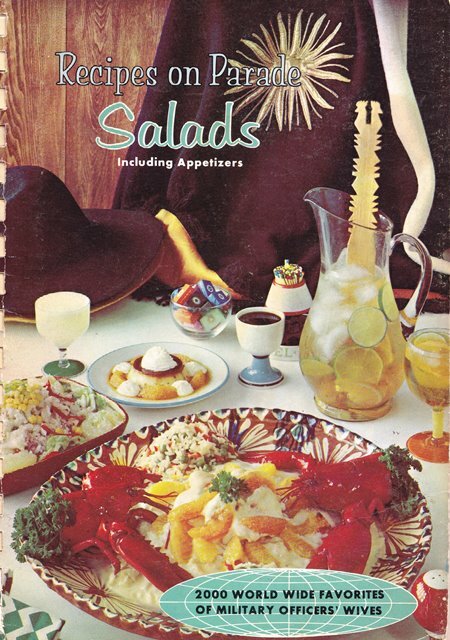 I’ve got this book, the worst one in it (in my opinion) is a tie between gelled corned beef salad and the deviled egg mold.i have a bad habit of picking up scary vintage product booklets. I am pretty sure this explains the inspiration for The Blob, which certainly resembled these food choices. Maybe the cottage cheese and kidney bean thing was supposed to vegetarian? but with some yummy bone marrow to hold it all together. A truly sad cultural icon, eh? Food fads always result in some weird stuff, but never moreso than when the fad is for a piece of food preparation technology. Because then people try to find as many uses as possible, never mind the plausibility. Smoothie machines the latest fad? How about a pizza smoothie? MICROWAVE ALL THE THINGS. And so forth. 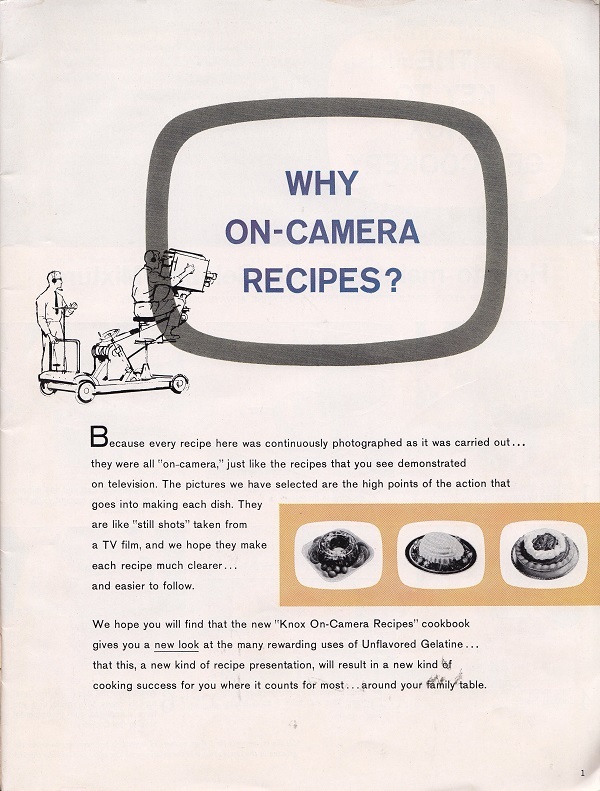 Never mind the food, the kitchen decor, cameras and lighting are more interesting to me. SunLink’s WOTM had a description of “television cameras big enough to eat Chicago” and these must be of the same kindred. I think I used to have that — when I was a kid I used to collect recipes. But definitely not something for most collections 54 years later! Why would you do that to a perfectly good salad. WHY. I actually found this book among my mom’s things! It was horrible–she probably got it from my grandmother since my mom would have been nine years old in 1960. 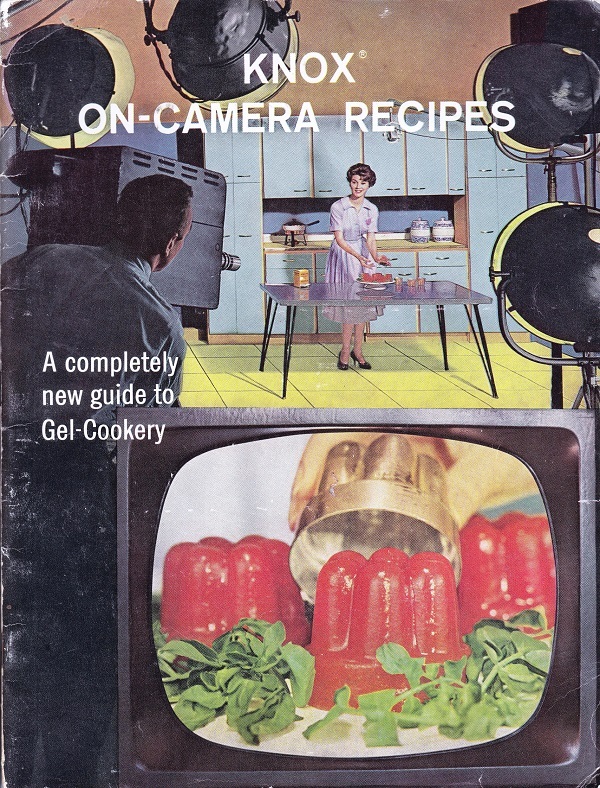 I’ll never understand the gelatin recipe trend that was apparently going on then. I want to try gelling things! It looks like fun! There has to some things that works fine in gelatin, but I fear I will have to go through some horrid variants before discovering the good stuff. I am just too young to really remember the fad myself, I have some vague childhood memories of shrimp and eggs and vegetables-jelly, which I remember as being really marvelous!